Published by Joshua Clare-Flagg on 27 Jan, 2017. 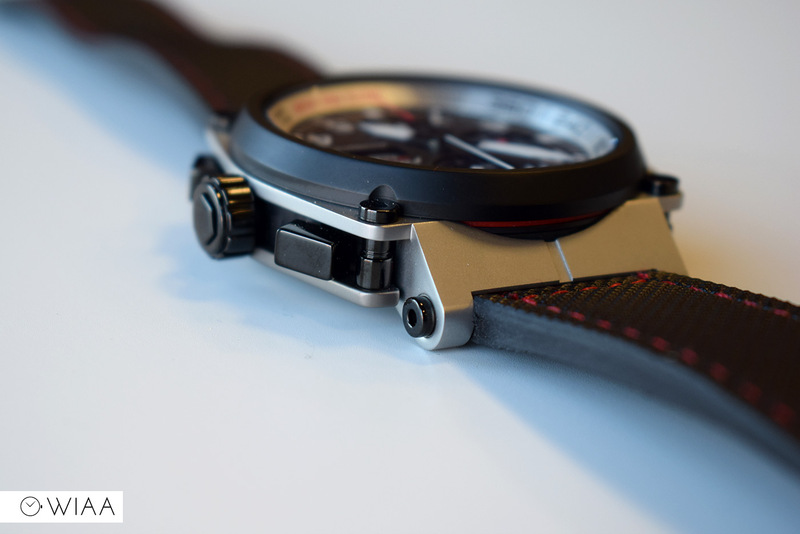 Watches with the indisputable ETA 7750 movement don’t tend to be cheap. 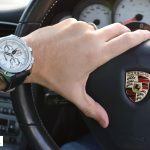 Doing a bit of research, the cheapest you’re likely to find one is for around the £700 mark – but then that’s for a watch that does nothing in the design or construction department. 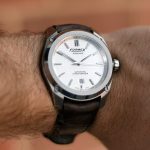 To get a decent ETA 7750 watch, you’ve got to easily go above £1000 – but even then you’re looking at £1500 for the decent watches. In steps Formex. Founded in 1999, they have just undergone a huge revamp of their business model and completely opted out of brick and mortar sales, going down the direct and online only route. 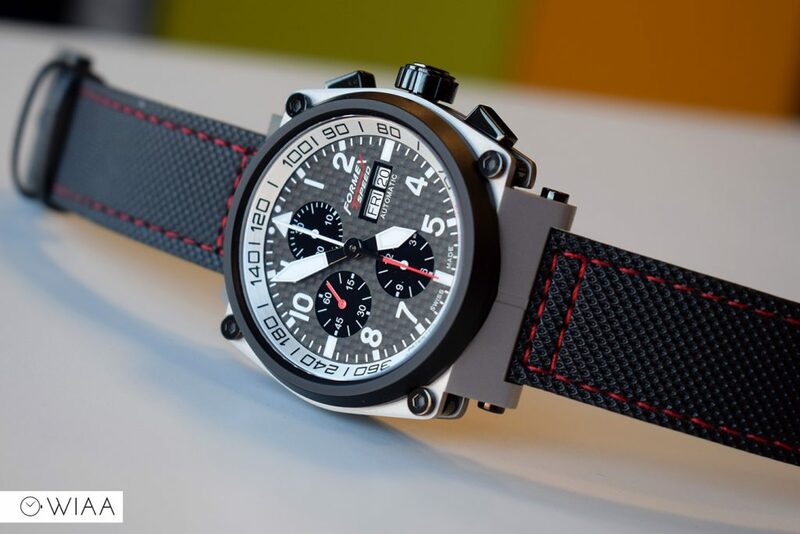 Completely Swiss Made and featuring their patented case suspension system, I was extremely intrigued by their offerings as they are indeed very affordable for what they offer. 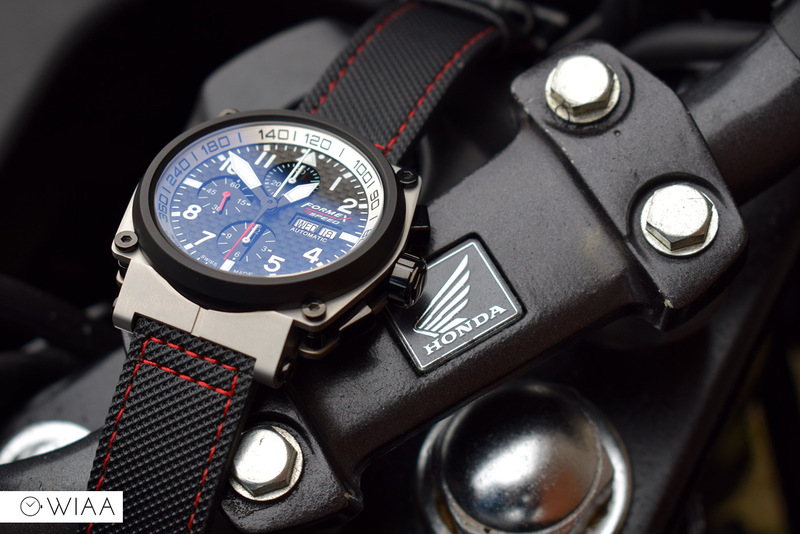 The watch in for review is the AS1100. Costing £1078, for an ETA 7750 that’s a very competitive price. 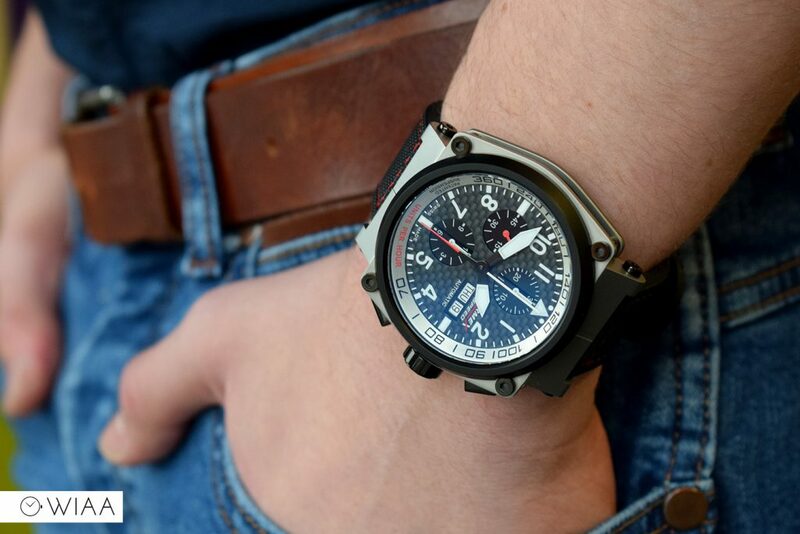 Going through the order process, I was extremely impressed that every watch sale includes the taxes and import duty, plus lightning fast delivery. 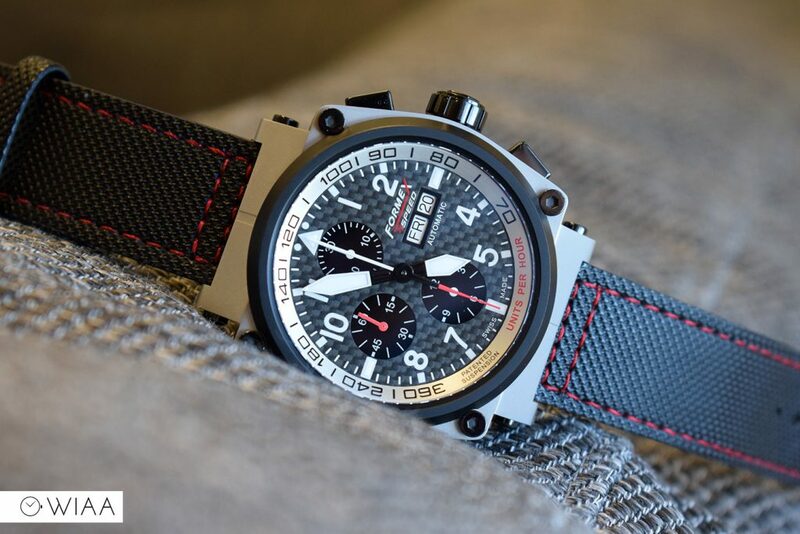 I will say this now: it’s very rare for me nowadays to be blown away by a watch from the moment I open the case. Let’s take a closer look to see if how it stacks up for the money. 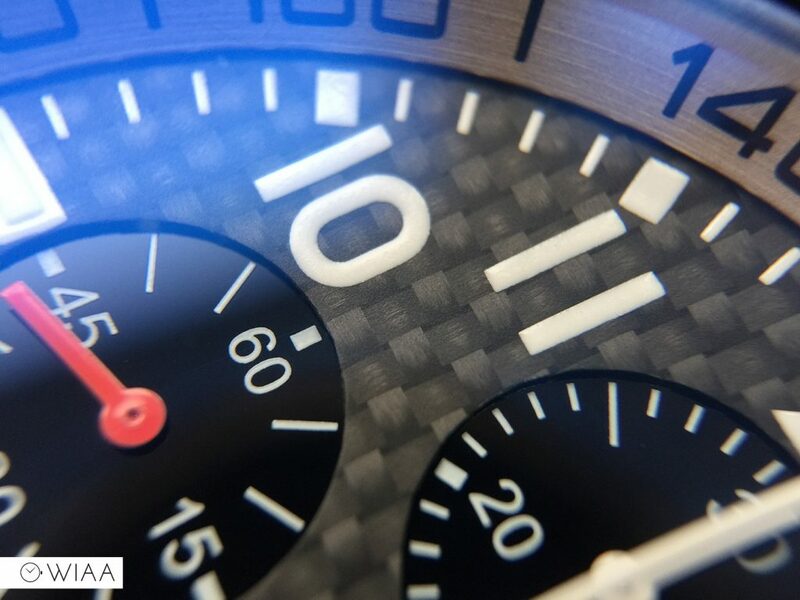 The primary feature of the dial, and indeed throughout the watch, is the carbon fibre. 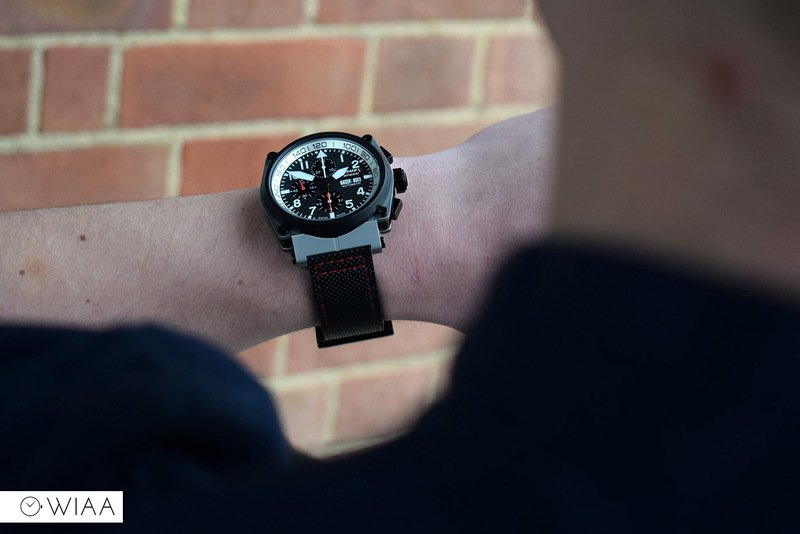 Nothing says motorsport more than this material, plus it looks incredibly cool. The weave is thick and very apparent, providing a splendid viewing experience. 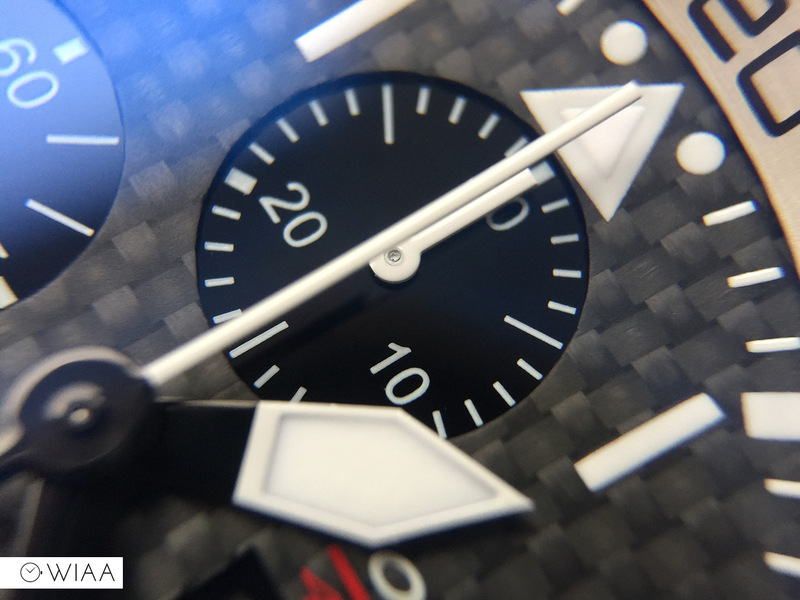 The subdials are laid out in the traditional ETA 7750 way – 12, 6 and 9. These are all on a lower level with a polished finish to them, which reflects the light well – but not in a glaring way. The dial has a bold design, with huge hands which seem aviation inspired and oversized hour numerals. 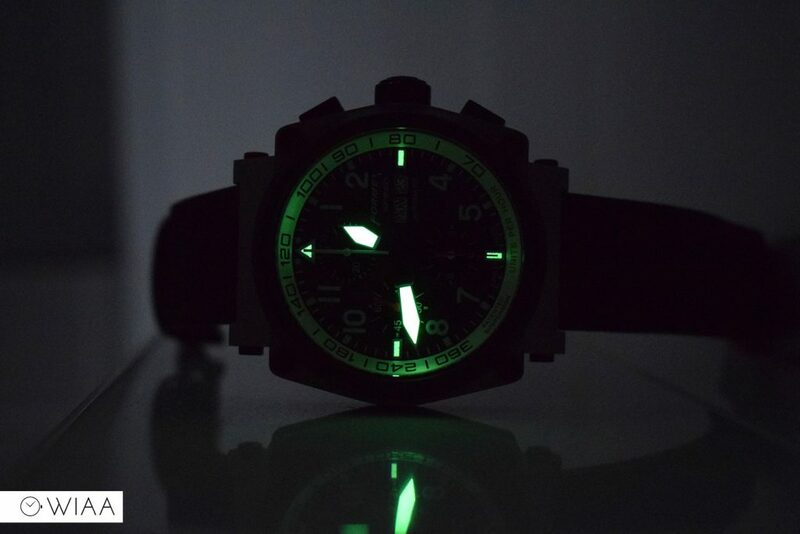 The lume used has impressed me greatly: it is quick to charge and glows very bright. The day / date indicator is located at 3, with the logo printed just above it. 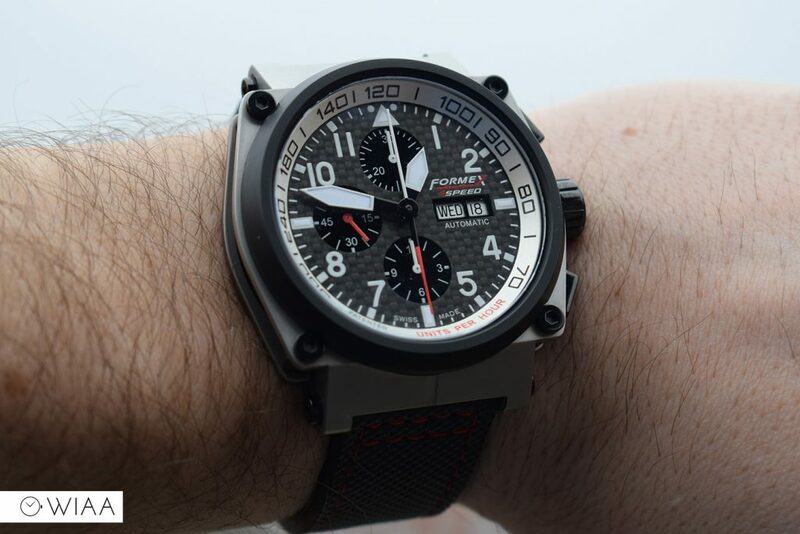 Some may prefer black wheels to match the dial, but for me the white increases legibility massively and they also match the bold white numerals. 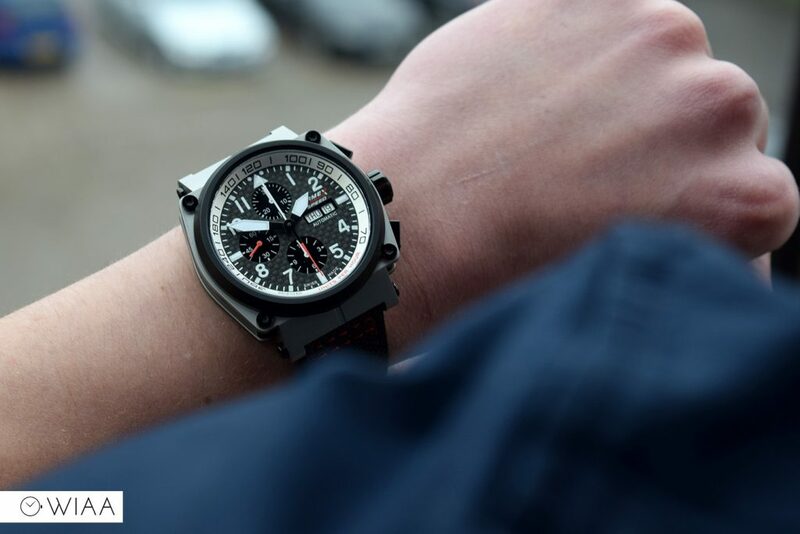 The big seconds hand acts as the chronograph hand, but is two sided. 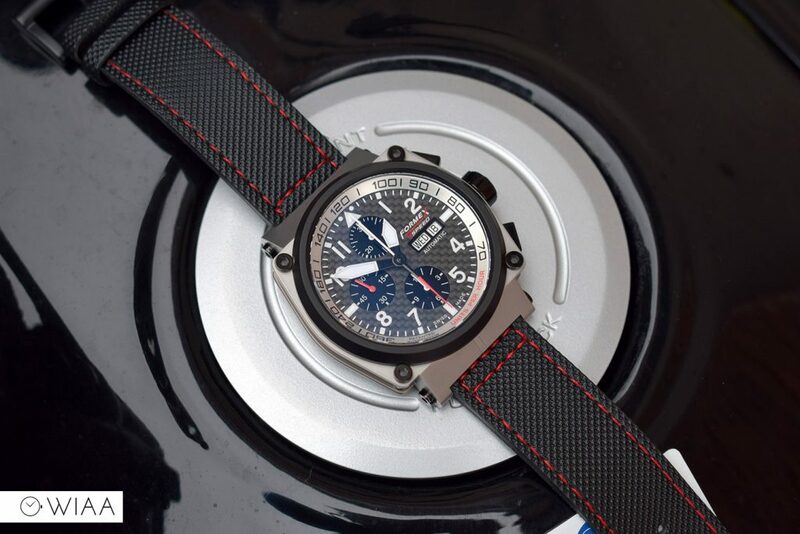 The red base refers to the tachymeter markings on the rehaut, which explains why the markings are 180 degrees out. 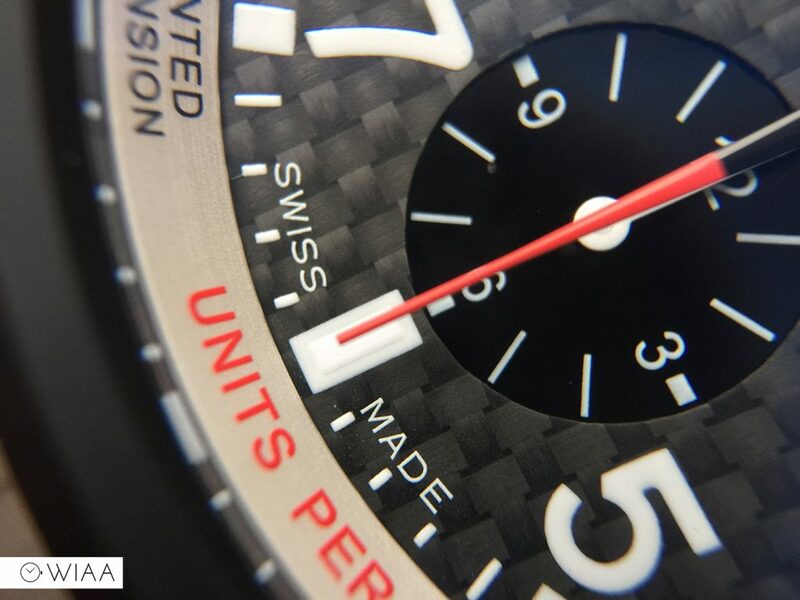 The dial is well designed, as well as being superbly constructed with impressive precision. There’s no doubt that the case is very angular and bold. 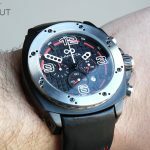 It has a complex and impressive construction, almost giving the impression of a Hublot on a budget with its top and bottom pieces with a separate barrel in-between. What is cool is the suspension system – not completely necessary but a very interesting innovation. 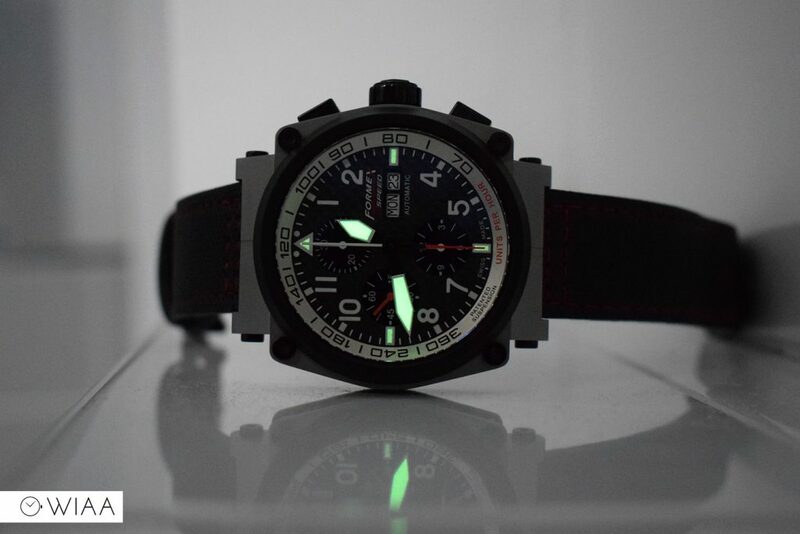 The sapphire crystal with it’s anti-reflecting is an absolute joy to look at, and for me makes the difference between this looking like a great watch and a superb watch. The AR coating is “hard-coated” so hopefully that means it won’t scratch off, which can happen. 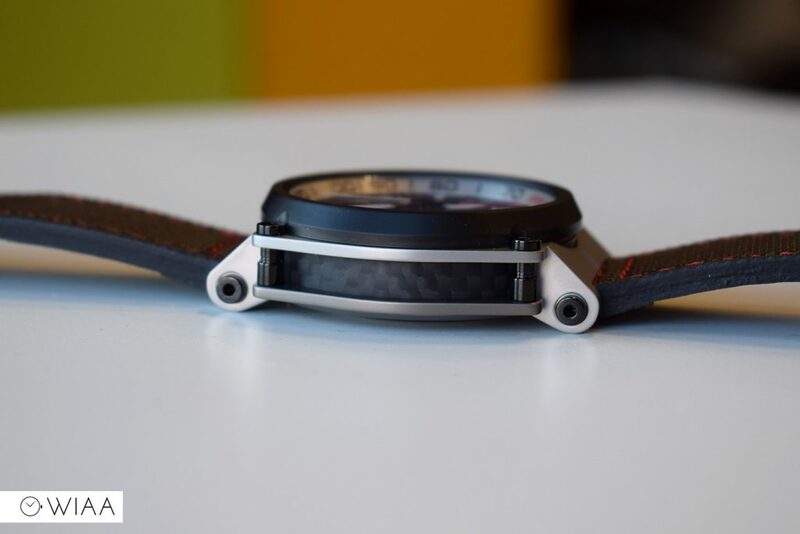 The case top and bottom is made of Grade 2 titanium, which includes the lugs. 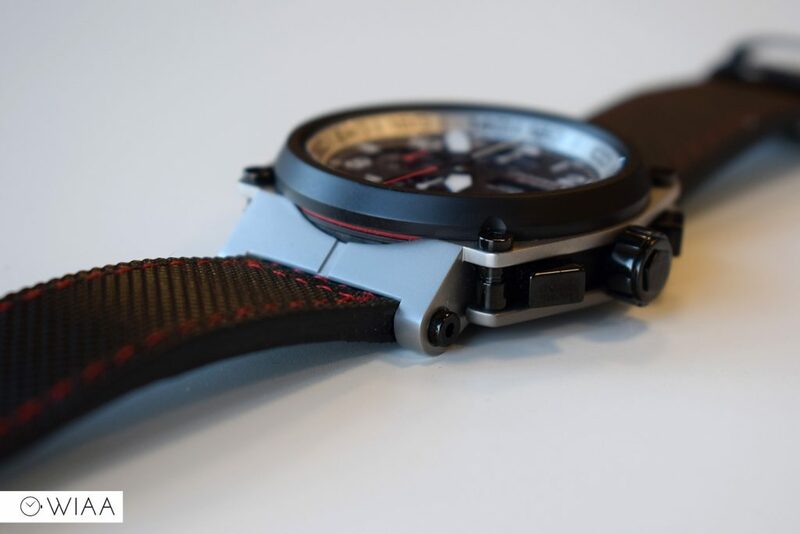 There are PVD elements throughout which provides a good contrast between the light grey and black. 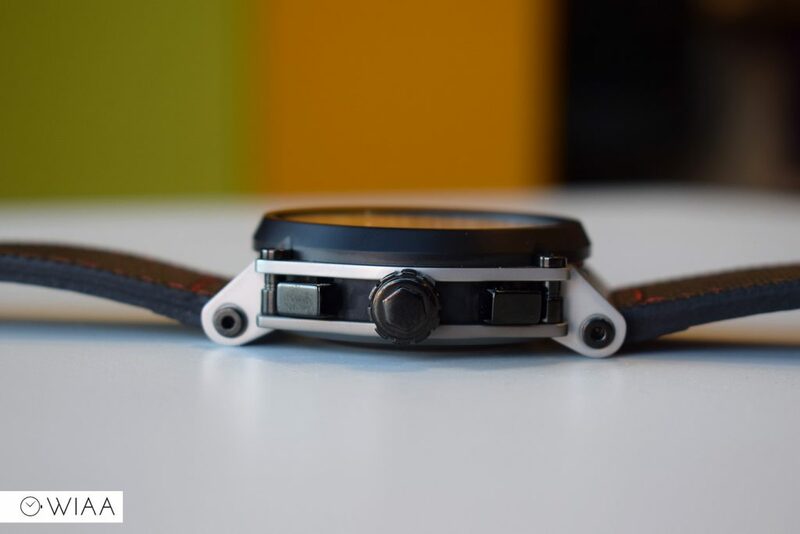 These include a PVD bezel and suspension, plus screws either side of the lugs holding the strap in place. 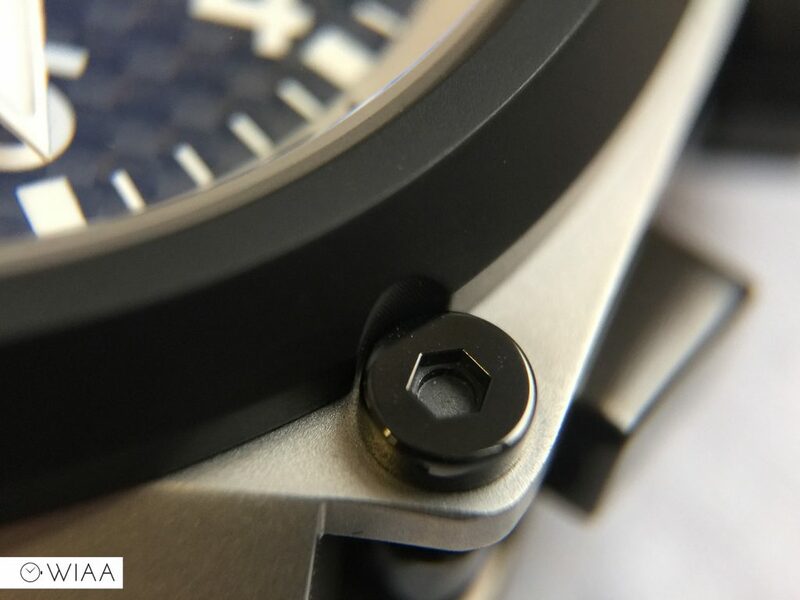 The bezel is raised above the crystal providing some protection to it. 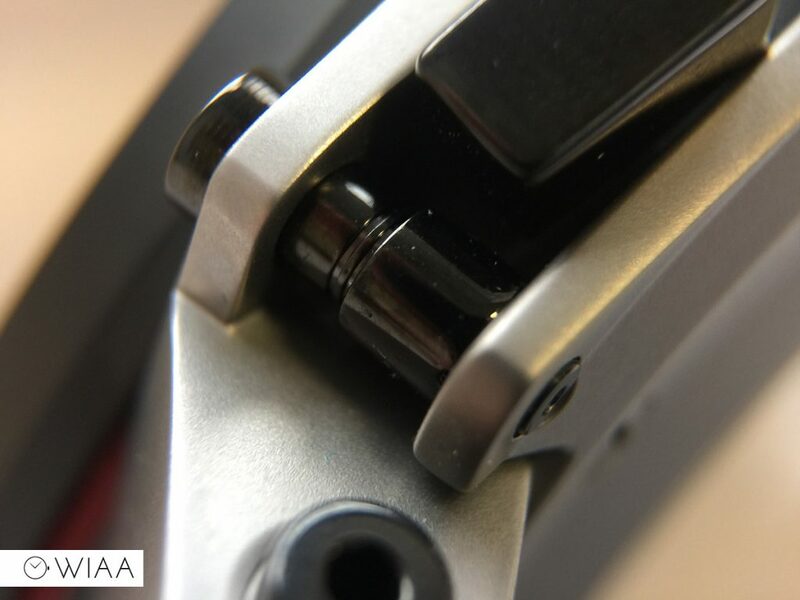 There are carbon fibre sides of the main barrel, with a thin red strip at the top, just below the bezel. 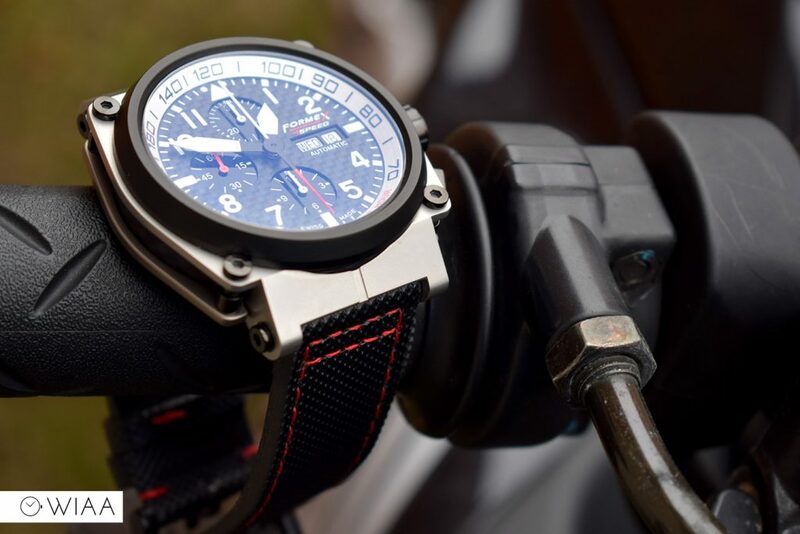 A cool touch that shows close attention to detail. The pushers are coated but look a little plasticky. They also wobble a bit on their axis which I wasn’t expecting – view the video review to see this. It’s not a fault and they can move on purpose – it’s to be able to cope with the severest angles from the suspension system. Whilst it doesn’t bother me, it took me by surprise and is definitely something worth noting. The crown is of a similar feel, which is unsigned but has a hexagon embossed on the end. 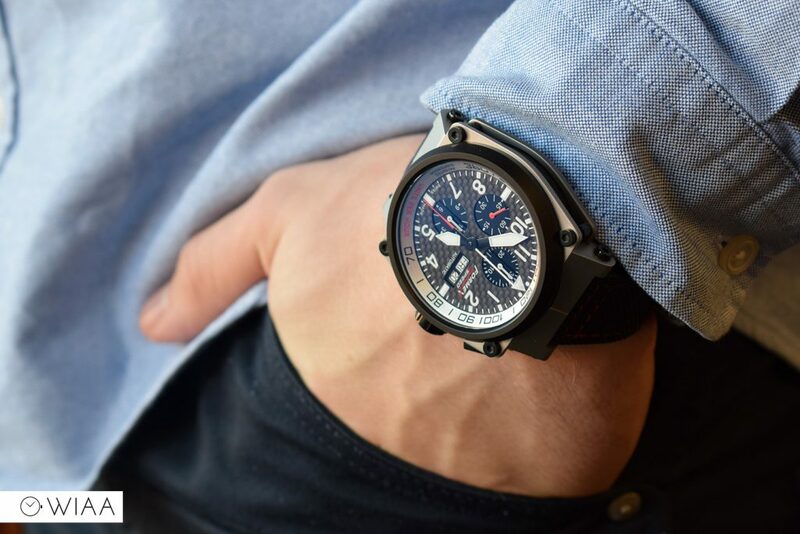 It’s large enough to use easily to manually wind and set the watch. 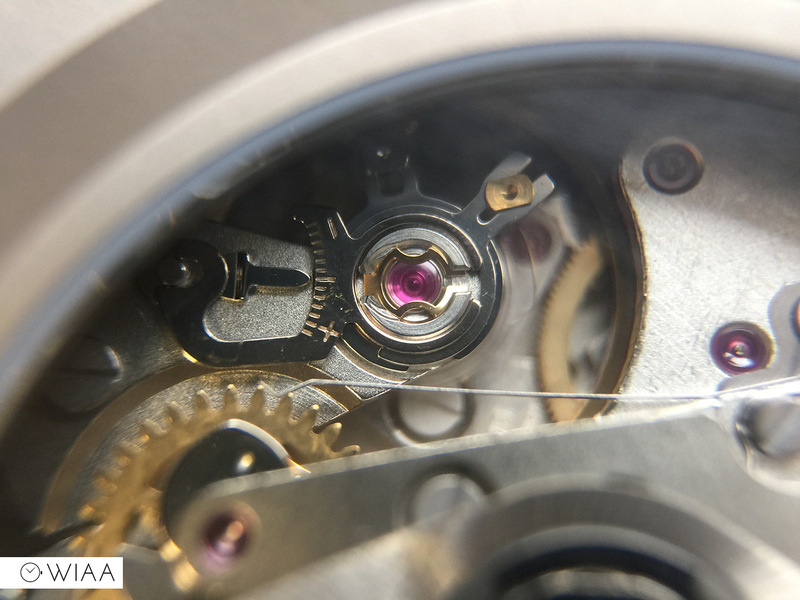 The caseback is fairly straightforward, with the main component being the sapphire crystal exhibition window to show off the movement. There are details deeply engraved surrounding this. 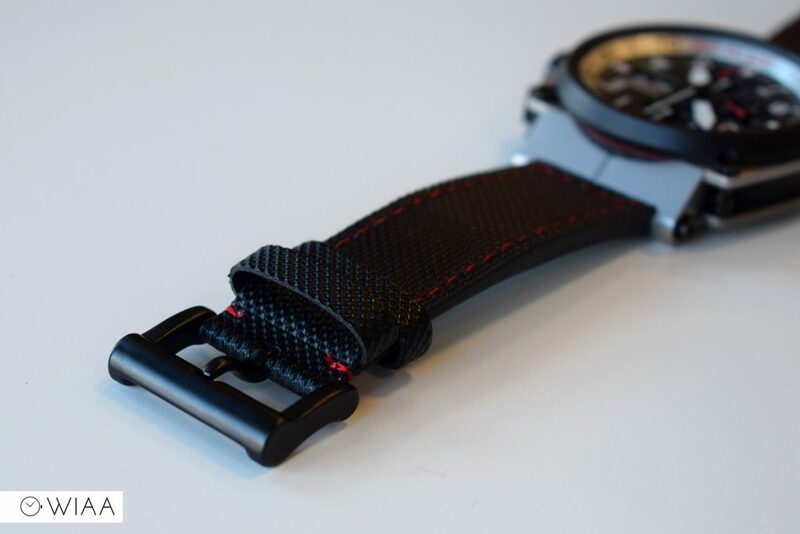 The strap is leather, with what feels like a canvas style top to it. 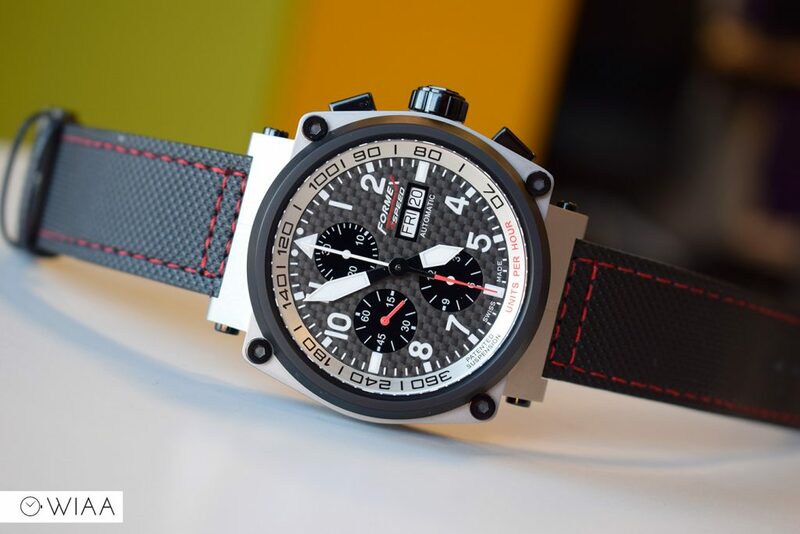 It’s black to match the racing theme and PVD elements of the case, with additional racing themed red stitching down the sides. 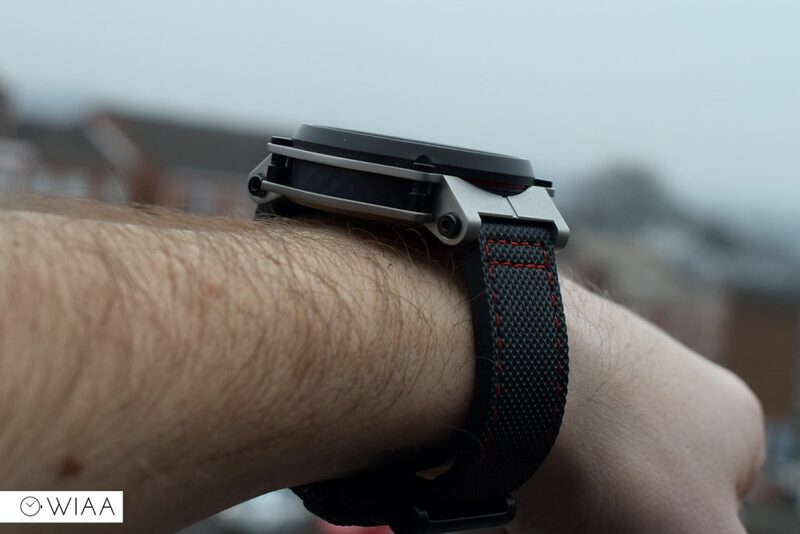 To be completely honest, there’s nothing too crazy to say about the strap. It’s comfortable, but a little stiff to begin with (possibly due to the extra layer of canvas on top) which promptly loosens up. 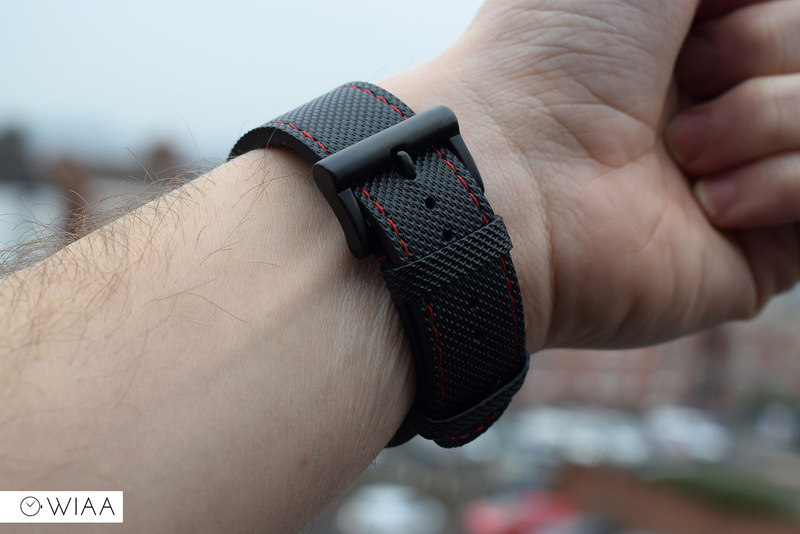 The strap has a PVD tang buckle that is square in shape, with a very rounded top bar. The finishing is matte and there are no engravings or markings. 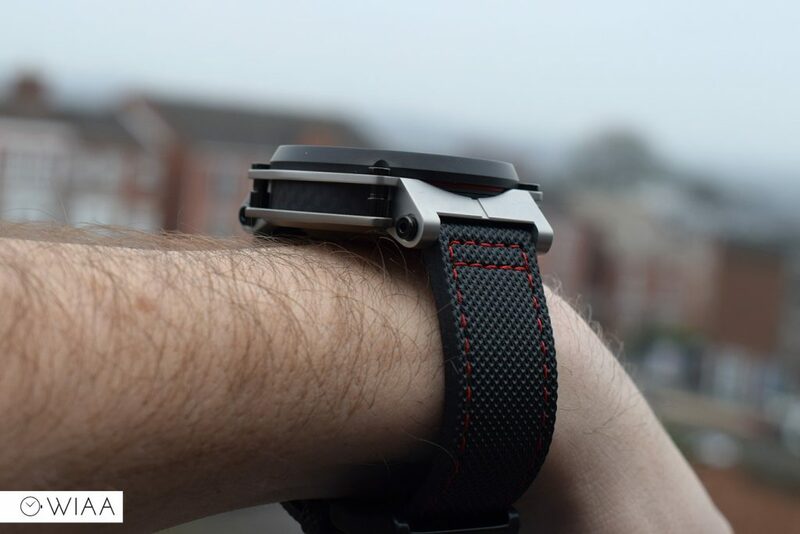 A 46.5mm diameter case would usually demand a 24mm strap, but in this case the 22mm width does a good job and doesn’t look out of proportion. 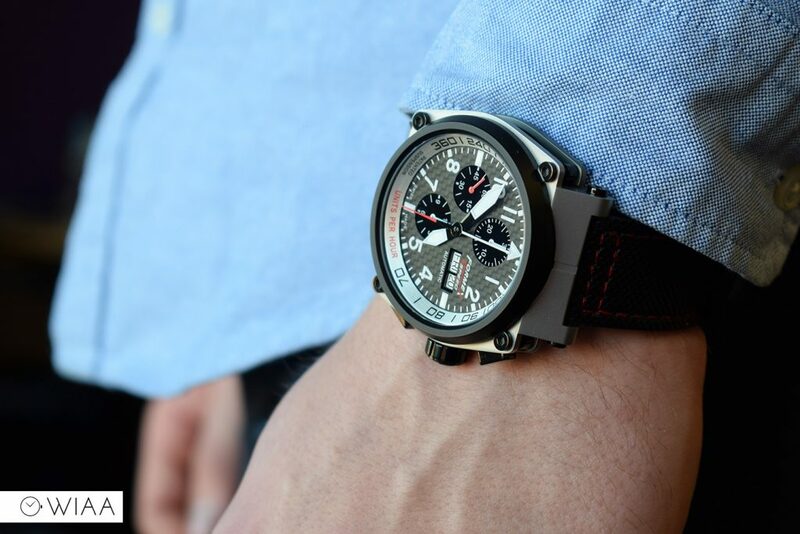 Created in 1974, the ETA 7750 is widely regarded as the most successful automatic chronograph movement ever made. 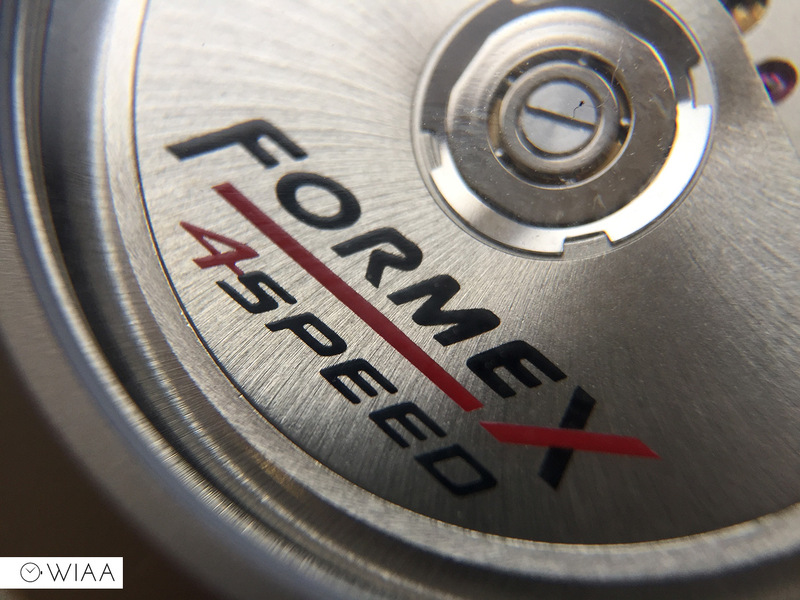 Formex have applied custom printing of the logo on the rotor, to make it a little visually interesting. 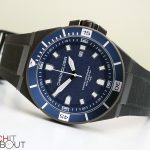 Various key specifics include it having 25 jewels, it runs at 28.8k bph (8 ticks per second), 44 hours power reserve, hand and automatic winding, and hacking seconds. 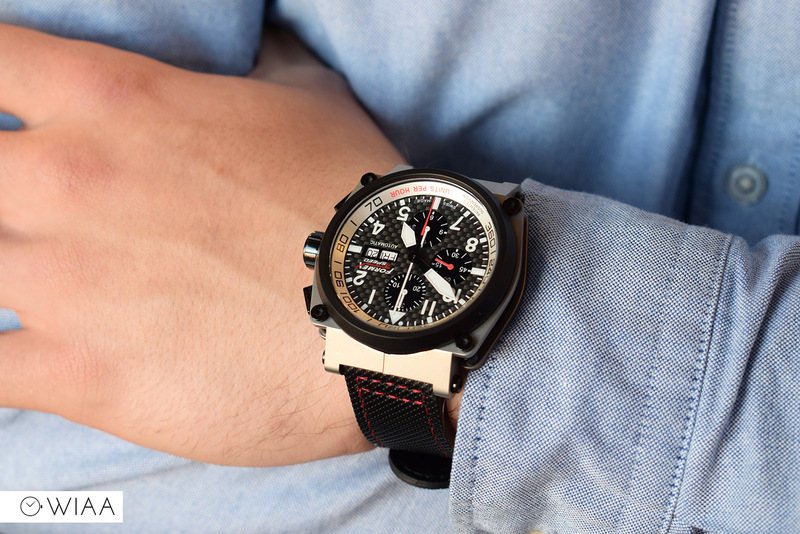 Unlike many quartz chronographs you see which have an hour chronograph dial, the 7750 has a 30 minute counter dial (at 12) and then a 12 hour indicator (at 6) for the chronograph feature. 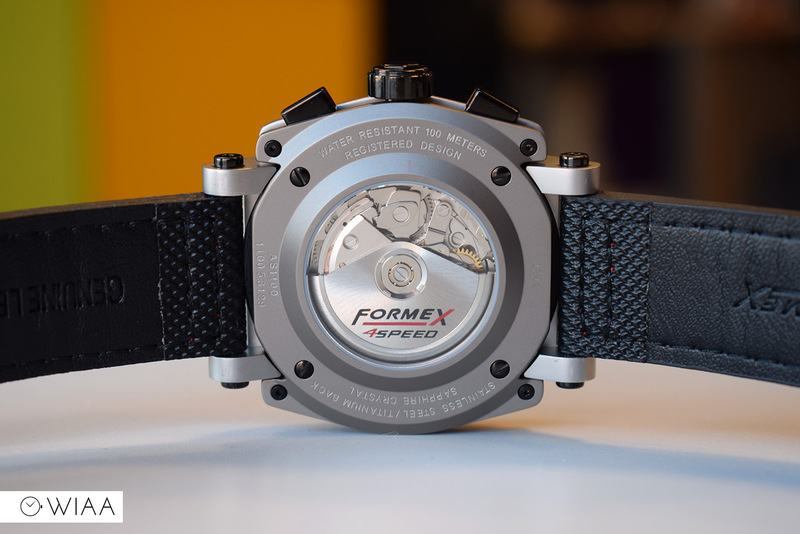 This means that the hand will spin around the top dial twice per hour. The running second hand is located at 9. These movements, whilst being very accurate and reliable, are quite delicate beasts. Just make sure you don’t change the time or date between 10 and 2. 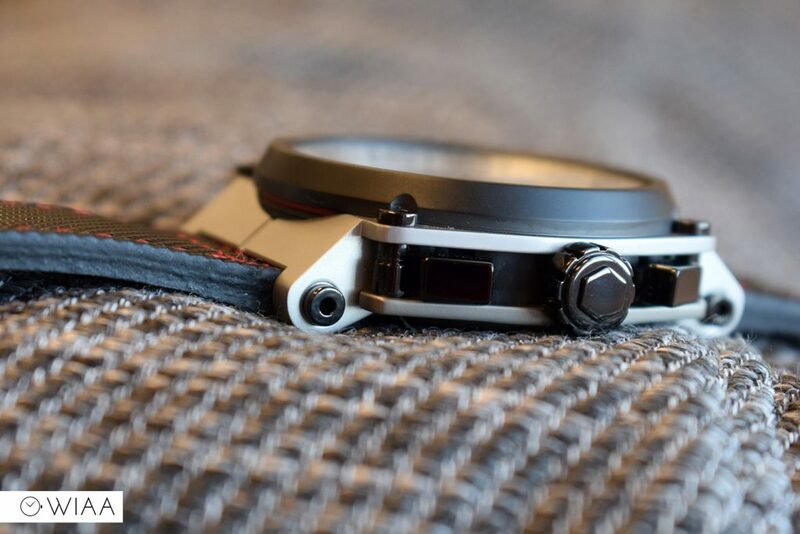 I’ve tested the accuracy with my Lepsi Watch Scope – and it’s an excellent and very impressive 2.2 s/d, well within COSC specs. 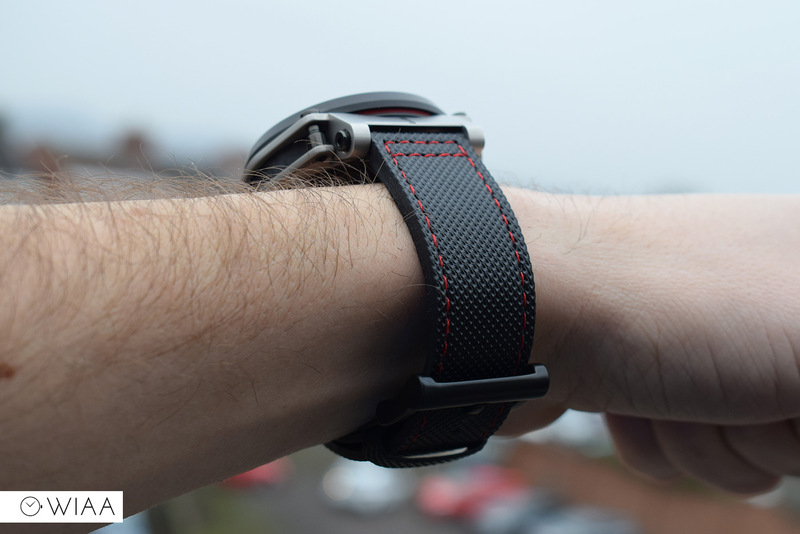 I’ve not been this impressed by a watch from the moment I opened the box for a long time. It doesn’t happen very often at all, and when it does, I feel delighted. 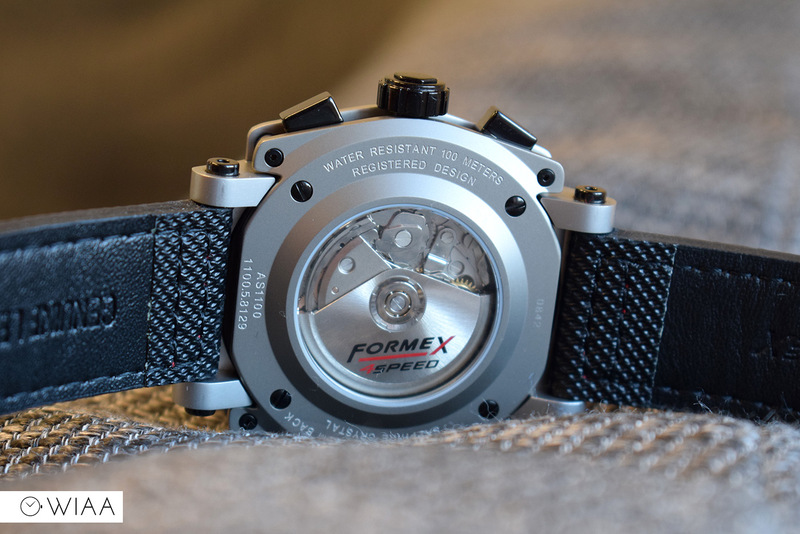 The quality of the Formex AS1100 is genuinely one of the best I’ve reviewed. 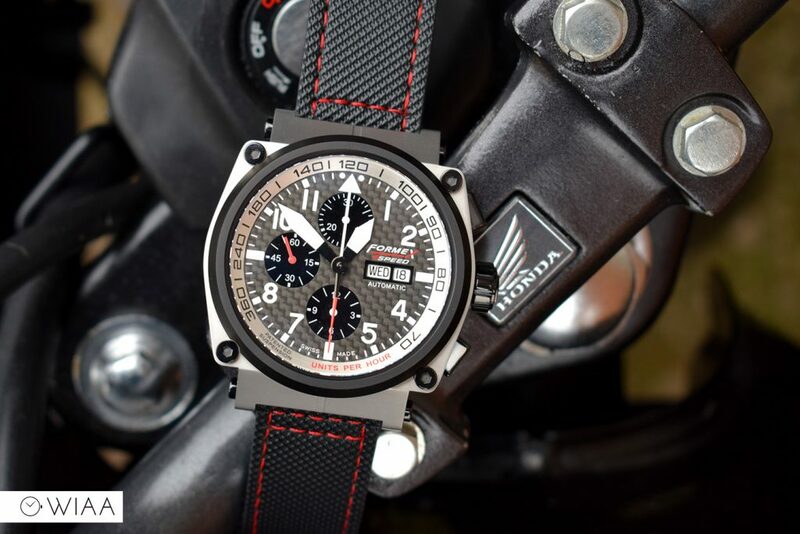 The construction of the dial and case is excellent, especially when you think about the suspension system, titanium and carbon fibre involved. 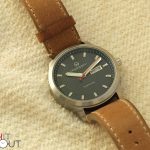 Especially gorgeous is the sapphire crystal and the remarkable anti-reflective coating that belongs on a watch worth 3 times the price. There’s one small niggle that needs to be remembered, that of the slight wiggle in the pushers. This is purposeful in order to allow the suspension to flex fully. It doesn’t bother me, but it might be a turn off for some. 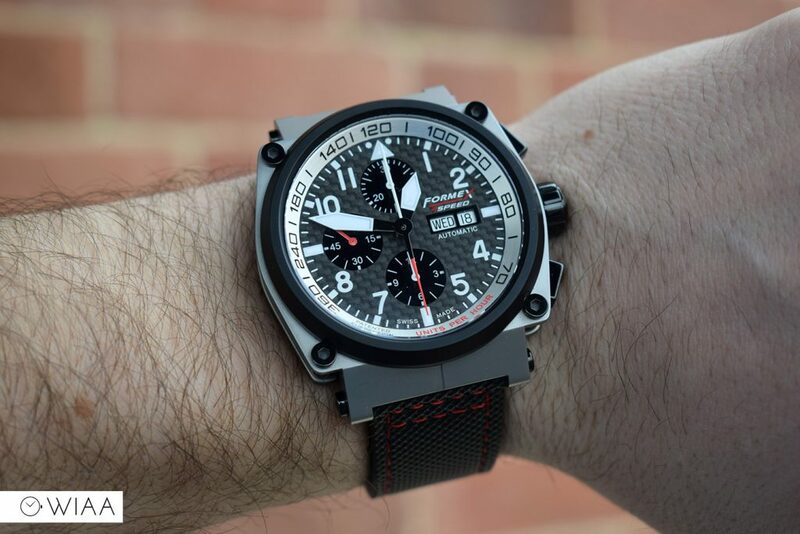 For just over £1000, I don’t think I’ve seen a nicer Swiss Made chronograph for the money. 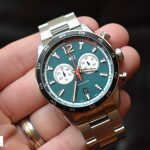 Ok, the Christopher Ward Trident 600 Chronograph gives it a good go, but it’s over £400 more which is a fair whack of dosh. I’ve fallen in love with the Formex AS1100 and if you go for one, you will to.